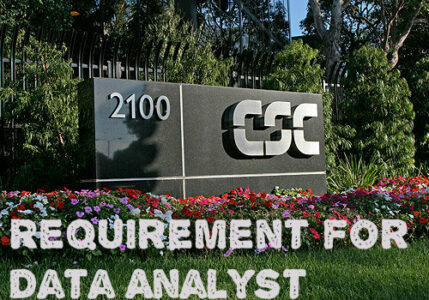 Computer Science Corp (CSC) has invited applications for recruitment to the post of Data Analyst. The eligible candidates can apply for the post via online registration on CSC official website. Work and tool Experience . (in years) : 2 Years Top 3-5 skills & min. year experience required for each : SQL(2), Analytics(2), Excel(2) Analytics (Optional), SQL (Must Have), Excel (Must Have), PowerPoint (good to have), NIT from Good branch (Computer, Electronics, IT, Mechanical, Electrical, Metallurgy, Chemical), BITS Pilani, IITs (any branch), 2 years of experience, Shift hours Mon-Tuesday 3 PM TO 12 AM Wed- 2 pm to 11 pm Thursday-Fri 12 pm to 9 pm..